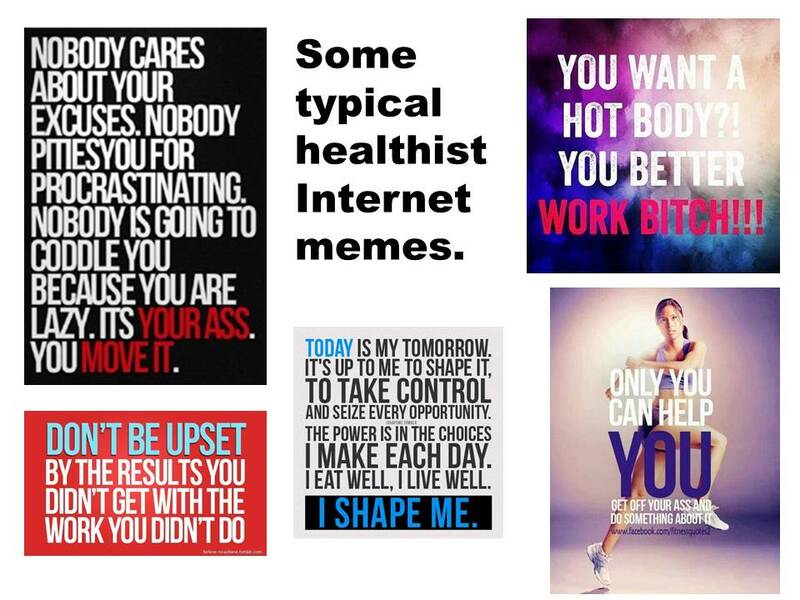 Every once in a while – most often on Facebook or in the online comments to a blog post – I encounter the idea that the “health” part of the Health At Every Size® model is inherently oppressive and healthist. This criticism makes me uncomfortable, and I find myself bristling a bit. These are important signs that I have learned to recognize as signals of some unexamined and unprocessed privilege. I have written about healthism and the HAES model before, but maybe it’s time to take another look at healthism, this time in light of the concept of privilege. Healthism was originally defined by Robert Crawford as a “preoccupation with personal health as a primary – often the primary – focus for the definition and achievement of well-being.” It has evolved into the often unspoken idea that there is a moral value to health; it emerges as the assumption that people should pursue health. It’s the contempt in the non-smoker’s attitude toward smokers; it’s the ubiquitous sneer against couch potatoes.” Healthism includes the idea that anyone who isn’t healthy just isn’t trying hard enough or has some moral failing or sin to account for. Consider: how many times have you heard or said the words “I’m so bad” in reference to eating a sugary dessert or to choosing to stay home rather than go to the gym? The recent kerfuffle over Maria Kang’s “What’s Your Excuse?” viral Facebook message shows that the forces of healthism are alive and well in our culture (though it was refreshing to see how many people called out Kang’s bully tactics). More subtly, healthism represents the widespread ethic of individual responsibility for health in our culture. In the debate over U.S. health care reform, we obsess over the health of individuals, whether it’s reshaping individual behavior to our liking or finding ways to pay for the expensive treatment protocols that we see as being needed because of people’s personal “failure” to care for their own health. Maybe it’s more than just our training that holds us back. Maybe we need to acknowledge our basic healthism instilled by our cultural milieu as well as our professional training. And maybe we need to unpack the privilege that has allowed us to focus so much attention on the role of individual behavior in health. I understand the concept this way: Privilege consists of unearned advantages of members of certain social groups solely because of their membership in those social groups, and at a cost to corresponding marginalized groups. Privilege is generally invisible to the privileged individual or group. Privilege can exist on the basis of just about any type of social difference, including race, ethnicity, gender, sexual orientation, socio-economic status, education, ability, and size, among others. Is it appropriate to talk about privilege in the context of healthism? Does it fit? My thinking goes something like this: participation in the discourse of individual responsibility around health is only possible for those who do not feel subject to the collective determinants of health. 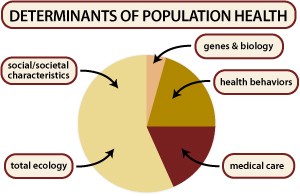 I happen to think it’s beyond argument that we are all subject to a variety of collective determinants of health. Americans, especially, find this idea distasteful, no doubt because we tend to espouse a profoundly individualistic approach to life and prefer to believe we control everything about our own lives. Nevertheless, many citizens of industrialized democracies experience themselves as beyond the social and environmental influences on health and instead experience themselves as – for better or worse – empowered around their individual health. Healthy? Good job! Well done! Keep up the great work! Unhealthy? Lazy! Glutton! You should have eaten more kale! This experience of empowerment sources a healthist privilege. We like to pretend that our social and natural environments have nothing to do with our health outcomes, regardless of what those outcomes are. I confess that my sense of privilege as important to understanding how healthism works is as much intuitive as it is logical at this point. Do you agree that there is a privilege component to healthism? And if there is, how is this insight useful? How does healthism apply to the HAES model? For example, by making them part of the HAES principles, are we tacitly conveying a moral duty to engage in intuitive eating and joyful movement practices? Surely not every instance in which we recommend a particular health-related practice is automatically healthist, but I do think we need to talk about this. Do we need an asterisk on every health recommendation – an implied “but only if you want to”? Are there other hidden sources of healthism in how we use and apply the HAES model?